Earlier this year, former President Barack Obama commuted the sentence for Oscar López Rivera, who served 35 years in prison for seditious conspiracy and charges related to his work with the Fuerzas Armadas de Liberación Nacionala (FALN). The militant Puerto Rican independence group claimed responsibility for a series of bombings beginning in the 1970s that resulted in five deaths. López Rivera’s supporters argue that prosecutors presented no evidence linking him to any FALN act that resulted in casualties. 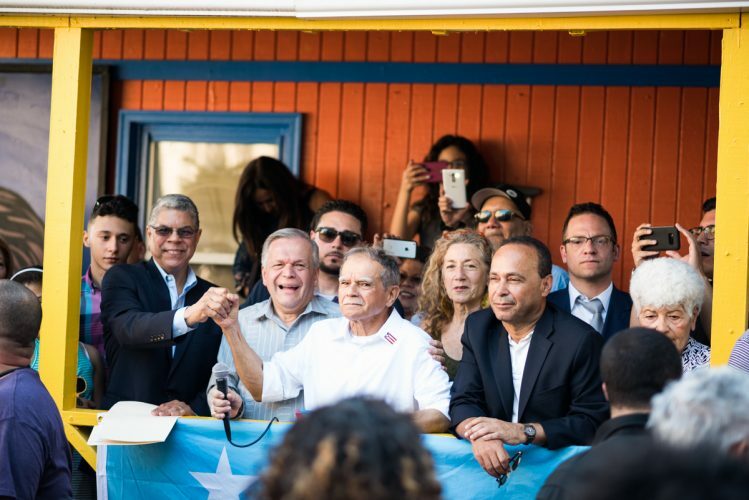 On Thursday, López Rivera returned to his home neighborhood of Humboldt Park. In 1967, after serving in the Vietnam War, he became an organizer in the community, where he led a campaign to create Roberto Clemente High School and open an alternative school for Puerto Rican dropouts. He also co-founded El Rincon health services for drug addicts and helped establish a local office of ASPIRA, which supports the educational and leadership development of Latino youth. His release from prison comes at a time of escalating crisis for Puerto Rico. In recent weeks, Puerto Rico declared a form of bankruptcy, a first for an American state or territory, and the Justice Department denied the island $2.5 million to pay for a referendum on its status as a commonwealth. Last year, Congress handed over control of Puerto Rico’s finances to an unelected federal board that aims to resolve the territory’s crippling $72 billion debt through austerity measures such as mass school closures. More Puerto Ricans already live outside the island than on it, and conditions there threaten to fuel more migration from the territory. We spoke to José E. López, who is the executive director of the Puerto Rican Cultural Center in Chicago, about his brother’s role in the independence movement. José E. López is the co-founder and executive director of The Puerto Rican Cultural Center in Chicago. His brother, Puerto Rican independence leader Oscar López Rivera, had his prison sentence commuted by President Barack Obama and is being released after serving 35 years behind bars. Can you tell me more about your family? When did you move from Puerto Rico? My father came here in the late ’40s, which is part of a massive migration of Puerto Ricans to the United States. The entire family moved to Chicago in 1959. We’ve lived here our entire life in this area. So when Oscar gets here, were celebrating 50 years of his community-building legacy. As someone growing up in Chicago, how and why did you and your brother become so connected to the Puerto Rican independence movement? Even though we were citizens of the United States, it became very clear that there was some dynamic here at work, some unnatural causes that were really behind the high unemployment, the low school achievement of our youth, the inequities in health, the absentee landlords in relationship to the living situation here. So it’s against the backdrop of the marginalization of the Puerto Rican community in the United States in which we begin to think, well, we are a colony of the United States. Because Puerto Rico has been a colony of the United States since 1898, defined by the U.S. Supreme Court in 1922 in a case called Balzac v. the People of Porto Rico … the U.S. Supreme Court says Puerto Rico belongs to but it’s not a part of the United States. We’re not a part of the United States. We are a piece of possession of the United States. We’re a piece of property of the United States. So the United States can do whatever it wants with Puerto Rico. Even though we were made citizens of the United States 100 years ago in 1917 … what does U.S. citizenship for Puerto Ricans mean? Two things: It means Puerto Ricans have the right to leave Puerto Rico without papers to the United States and to die in the U.S. armed forces, because Puerto Ricans would immediately be drafted into the First World War. And ever since the First World War, almost 400,000 Puerto Ricans have served in the U.S. armed forces. As a matter of fact, Puerto Ricans constituted the only Latino segregated military unit in the U.S. Army, the Borinqueneers, which is the 65th Regiment of the U.S. Army. I tell you that because it shows you at every level how marginalized, even at the level where we’re ready to die for the United States, we were marginalized as a people. In many ways, I think you have to understand a little bit of the Puerto Rican presence here and the Puerto Rican independence movement, sort of how you understand the development of the independence movement in India. It’s Gandhi in South Africa organizing primarily Indians in South Africa that led him to go to India ultimately and begin the struggle for independence in India because he saw the marginalization of Indian people in South Africa in a colonial setting. So I think that’s the way one has to view the relationship of Puerto Rico to the United States and the Puerto Rican presence in the United States vis-à-vis our struggles. Do you think the current crisis in Puerto Rico changes the goals of the independence movement? Or do you see these all as symptoms of colonialism? I believe all of this are symptoms of colonialism. In a crisis situation, what has the United States done? It’s responded not by making investments in Puerto Rico, not by helping to develop an economy, but by saying Puerto Rico must pay the debt. The Puerto Rican worker must pay the debt. But the Puerto Rican people did not incur that debt. And even you could say, ‘Oh the Puerto Rican governors [incurred the debt].’ No. You have to say what led to that debt is the relationship between Puerto Rico and the United States, because Puerto Ricans have never been able to fully develop and exercise their full economic self-determination. Nothing in Puerto Rico is controlled by Puerto Ricans. You’ve compared your brother to Nelson Mandela. Why do you consider your brother a political prisoner? All you have to do is study how many times in the 20th century has seditious conspiracy been used in the United States. You will see that overwhelmingly it has been used against the Puerto Rican independence movement, beginning in 1936 with the incarceration of the leader of the Nationalist Party, Dr. Pedro Albizu Campos. So we’re talking about almost 80 years or more that it’s been used almost exclusively against the Puerto Rican independence movement. Why would you use a charge like seditious conspiracy? So let’s look at how the law reads. The law says whenever two or more conspire to overthrow the legitimate authority of the U.S. government. Where is the legitimate authority of the U.S. government vis-à-vis Puerto Rico? International law recognizes that Puerto Rico is a colony of the United States. So what’s their legitimate authority? For you to have sedition, you must be a part of the United States. What do you see as your brother’s role in the movement moving forward? What is interesting to me is that my brother, who is coming home almost 36 years after being incarcerated, will come out becoming the emblematic figure of Puerto Rican unity in a country that has historically experienced deep political divisions that have totally torn families apart. My brother is coming out where every political party and every political tendency [supports him]. As a matter of fact, in the last election, there were seven candidates for the governorship. All of them agree on one thing—that my brother should be free. My brother received the support of all the religious bodies in Puerto Rico, all of the labor movement. He has [the support of] over 50 Nobel Peace Prize winners. Last year on June 20, there were activities in 45 countries calling for his release. Presidents of Latin America called for his release. The pope called for his release. I mean he’s become, just through his resilience, the power of his inner peace, I think my brother today has become the unifying figure of the Puerto Rican people. Next Post: MAY 31, 2017 – SF, BAY AREA – Welcoming Oscar Lopez Rivera – NEW VENUE!